Benjie has now been rehomed together with Bubbles, Londoners now. Oh my Benjie is clever, that’s his overriding characteristic. He watches the world and works it out and then decides his next course of action. Most dogs are happy to use the doors to go in and out but Benjie has worked out windows are also just as good. When he sees you with a new cup of tea just about to sit on the sofa that’s his cue to go into the kitchen to see if you have left any scraps lying around. Then there is the charm offensive, he is just under 2 and likes nothing better than a lap for you to stroke and admire his coat which is in great condition and makes you feel like you are stroking a teddy bear and he doesn’t move and is happy to lie there innocently until something interesting happens. It is hard to explain how clever he is and so when people ask I will say he bets on the horses. Gives you some idea. His ideal family would be active and someone at home most of the time with a larger dog as a companion. Can be a little rough and tumble with the smaller dogs, nothing aggressive just wants to play but giving his size and being boisterous and cunning ways he can be annoying to the smaller dogs. If you are interested in adopting Benjie, commonly known around these parts as monkey because he has climbed through the loft window on to the roof and sat there surveying all his realm, to the surprise of the neighbours, please email evelyn@pugs.co.uk . Benjie, Bubbles, Polly and Ruby AGA. I’m interested in adopting benji! He seems like the sweetest boy! I own an shih tzu, she’s 9 years old but also loves rough and tumbles. Hi is Bennie still available? I have a female pug (just over a year) and would love to find her a friend. Is Benjie good with other pugs? I live with my husband and we are due to have a baby in July. Also we visit my parents quite a lot, they have a cat. I would love to take on benjie and give him a loving home. 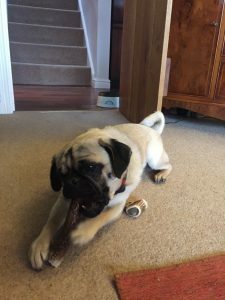 I am interested in rehoming Benjie he sounds just like my other pug Pablo. Please could you contact me. Benjamin sounds wonderful! A real character. We have a happy Springer Spaniel that would love him as a playmate/companion. Is he still available? 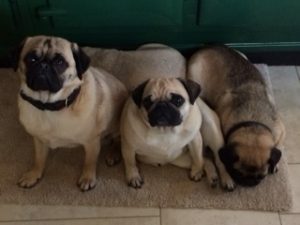 Hi, my name is Claudia, I have 1 black male pug already, he is 1 year old George, he has similar temperament to benjie, I think they would get on? He loves other dogs and always wants to play. His a really loving dog, and I absolutely adore pugs. Nice garden, and I take him for walks in the park too. Hi, I have 1 black pug he is a year and 3 months old, benjie sounds just like my pug George! He loves a little bit of tea after we have finished! I adore pugs and would love to adopt next time round! Homeschooled lad animal lover who can give attention to a dog. Home 24/7. Benjie looks and sounds awesome awww! I’m interested in adoption, my wife and me have a good home waiting here for a fury friend.. We live on the Essex sulfolk borders, Bishop Stortford, country side is excellent for dogs.